Extractions are a lot less common today than they once were, thanks in part to people taking better care of their teeth and advancements made in dental care. However, despite these advances, there are still times when an extraction of a tooth is the only possible option left. Wisdom teeth are the third and last molars on each side of the upper and lower jaws. They also happen to be the final teeth to erupt, meaning they don’t usually appear until your late teenage years or into your early twenties. The majority of adults have four wisdom teeth, on in each of the four quadrants, but in some cases it is possible to have fewer or more, which are often dubbed ‘supernumerary teeth’. Wisdom teeth can affect other teeth as they continue to develop. In some cases, wisdom teeth may only partially emerge or come in crooked, meaning they can cause severe discomfort and potentially lead to disease. Wisdom teeth that come in before they age of twenty will have fewer complications due to having less developed roots. This is why we recommended those between the age of sixteen and nineteen have their teeth evaluated to consider having them remove before further complications can arise. When a wisdom tooth is impacted and tries to erupt into the mouth, the flap of the gum on top of it may become infected and swollen, leading to severe discomfort throughout your teeth and face. This condition can result in an infection known as pericoronitis, which if left untreated, can often require a hospital stay and surgery. The removal of upper wisdom teeth are reasonably straightforward and can take be completed within a short appointment. Many lower wisdom teeth cannot be removed in a similar way to other teeth. When they are stuck beneath the gum, be it partially or completely, which means they can be lying at an angle to the neighbouring tooth. This will require a minor procedure to have these removed, which can be done under sedation if necessary. 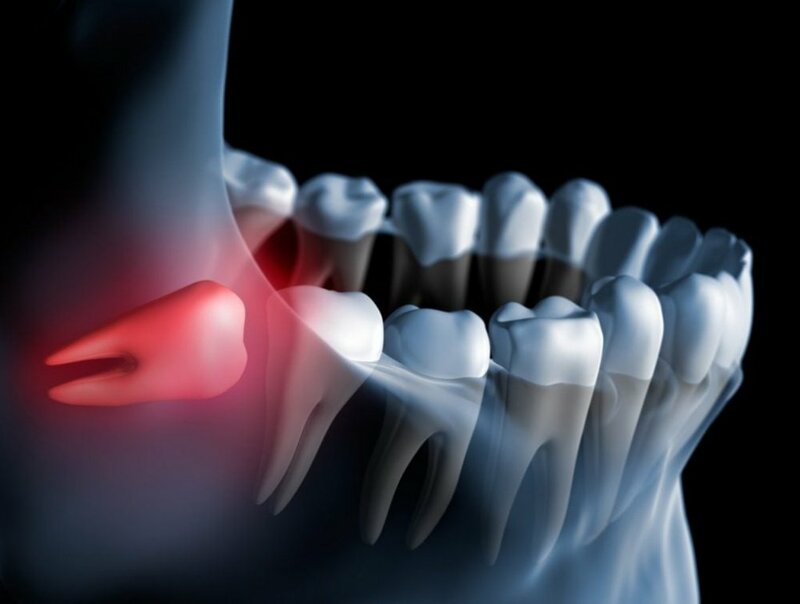 An impacted wisdom tooth can become cavitated and potentially push against the neighbouring molar, leading to tooth movement, decay and gum disease. In some cases, your wisdom teeth may cause your gums to feel tender, but this is quite normal and often doesn’t require having them removed. To find out the best possible treatment for you, we recommend making an appointment with your dentist, who will be happy to advise you on the best course of action to take. You can rest assured that you will be guided throughout your entire treatment by our team of caring patient coordinators, who will be more than happy to answer any questions you may have about your stay with us. In some cases, your treatment may be partially or fully covered by insurance and our customer service executive team can help assist you in filling out any forms necessary to claim towards treatment costs, meaning you will not require a referral or be stuck on a long waiting list to get the procedure performed. Both a local anaesthetic and IV sedation are available to patients, with your dentist deciding the ideal sedation based on your medical history and preference. Once you have been sedated, you should feel little to no discomfort during the procedure. Some discomfort may occur in the following days of your treatment as the gum begins to heal, however you can take painkillers to help alleviate any discomfort. Following your treatment, we advise that you rest for a few hours. This can be done in clinic in our recovery suite, should you require it. It’s also paramount that you don’t rinse for at least 24 hours and avoid smoking post treatment. In the following days after your treatment, rinse your mouth gently after meals and before bed using a mouthwash made up of a half teaspoon of salt and warm water. Hold the solution in your mouth for several minutes and spit, repeat this 2-3 times. Avoid alcohol, hot drinks and hard or chewy foods. Instead, choose cool drinks along with soft or minced foods and avoid direct contact with the open wound. Should bleeding occur, sit upright with your head and shoulders raised. Apply pressure using a small pad of gauze or clean linen clamped firmly between the jaws for 15 minutes. If the bleeding persists, be sure to contact your clinic immediately.